Five Mercy Thompson novels have topped the New York Times best-seller list, and her premiere graphic novel did the same. Now Patricia Briggs' heroic shape-shifter returns to comics! Mercy Thompson inhabits two worlds without truly belonging to either. To the human inhabitants of the Tri-Cities she's an oddity, a female mechanic operating her own garage. 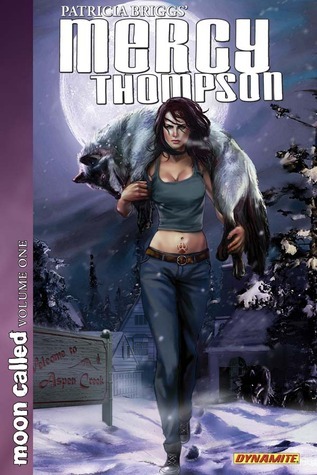 To the town's darker residents, werewolves, vampires, and fae, she's a walker, a last-of-her-kind magical being with the power to become a coyote. Mercy warily straddles the fine line dividing our everyday world from that darker dimension... 'till a boy, mauled by vicious werewolves and forever changed by the attack and on the run from those who committed the crime, appears at her door. Now her two worlds are about to collide! Outnumbered and out-muscled, can Mercy possibly save the boy... or even herself? This was a very accurate retelling of the first Mercy Thompson book, at the bare bottom minimum. I haven't read a whole lot of graphic novels, but out of the ones that I have I would say this one was done pretty well in comparison. I will say that while it was nice to see our favorite characters brought to life, I couldn't help buy feel that it was lacking something. It just didn't have that "rich" and full feeling that reading the actual books gave me. I do think that it is a really nice graphic novel to be read in addition to the real books, but in the end it pales in comparison to the original. Aside from Sam and Adam, I think the characters images were portrayed well. The guy's images just didn't fit what I had in my mind at all. If you like graphic novels, then this would be a perfect start into the series, otherwise I would say stick to the original books. In then end it was a decent read, but nothing overly spectacular like I have come to expect in the Mercy Series.